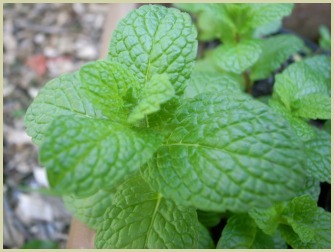 This guide gives you step-by-step instructions showing you how to grow mint. Growing herbs is an excellent way of always having a fresh supply of healthy, tasty leaves to your recipes. There are quite a few varieties available, water, ginger, curly, pineapple etc. But the two most popular are spearmint and peppermint. General Notes: The mint plant is a hardy perennial which means you plant it once and it will supply you with fresh leaves year after year. It thrives in most moist soils in the full sun or partial shade. Note: It does have a tendency to spread rapidly if you don't take care! Therefore. I prefer mine in containers as this helps contain the herb spreading all over your garden. Growing from seeds is not worth the effort, cuttings or root division are far better. In the spring dig up an established plant and gently divide the roots so you have 3-4 smaller plants. Plant in containers or straight into the prepared bed. You can pick the leaves throughout the year for use in your cooking. You can also dry the leaves and they also freeze well. One of my favourite ways of using them is to make a simple tea from the chopped leaves. Click for a tea recipe. This herb doesn't suffer from pests, but if you're unlucky, they may get mint rust. If this happens, dig up the plants and roots and burn.